Dr. Meinardus said the role of the Foundation in promoting liberalism in the country is focused on sponsoring educational activities such as trainings, seminars, workshops and conferences for party members and associates. He also highlighted the Liberal Philippines magazine, which since its inception two years ago has developed into a respected forum for the discussion of liberal issues. 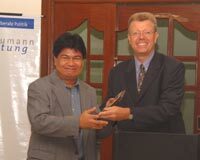 During a short and warm ceremony, Dr. Meinardus presented a plaque of appreciation to former Liberal Party Director General Mr. Eleazar “Eli” Quinto. Dr. Meinardus mentioned that he had first met Mr. Qunito some 15 years ago at a liberal leadership training in Sintra, Portugal. “He was the first Filipino I became friends with,” Dr. Meinardus said. Among the many guests were Governor Grace Padaca of Isabela Province, who recently joined the Liberal Party after scoring an impressive victory in last year’s elections and Bukidnon Congressman Dr. Nereus “Neric” Acosta, who has just returned from the United States, where he had been awarded a scholarship at Yale University.